IZArc is a freeware archive and compression utility supporting many archive formats including 7-ZIP, BIN, ISO, ZIP, and many more. With a modern easy-to-use interface, IZArc provides support for most compressed and encoded files, as well as access to many powerful features and tools. It allows you to drag and drop files from and to Windows Explorer, create and extract archives directly in Windows Explorer, create multiple archives spanning disks, creating self-extracting archives, repair damaged zip archives, converting from one archive type to another and more. In case you're still looking for a compression tool with support for most archive formats out there, there are a handful of choices that can accommodate your needs and one of the apps that can be included on that list is IZArc. The program comes a very simple interface, but the real power relies under the hood. The list of formats it supports is impressive and includes 7-ZIP, ACE, ARJ, CAB, JAR, LHA, PK3, RAR, RPM, TAR, TZ or ZIP to name just a few of the most common ones. IZArc brings to the table a solid set of features like advanced compression, drag and drop support, multi-volume creators, Zip encryption, UnSFX executable creation, file searching directly into archives and even more. 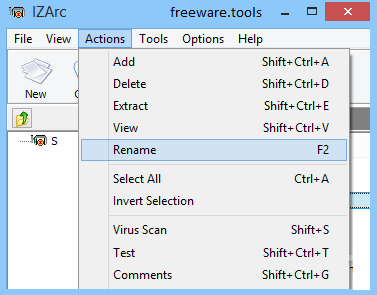 Just as expected, IZArc perfectly integrates into the Windows context menu, so you won't have any problem extracting files from archives on the fly. A nice feature we came across is the archive conversion capability that can turn any less known package into a more familiar ZIP or similar file. IZArc works impressively smooth, although it might seem to have some sort of issues when it comes to dealing with larger archives. It slows down the system a little bit when striving to extract files from archives over 100 MB, but it works just fine with the other ones. All things considered, IZArc puts up a very good performance and enables users to effortlessly manage any type of archive. Also, the strong feature pack that accompanies this utility certainly helps it make the list of recommendations.